The United States Congress designated the Wovoka Wilderness (map) in 2014 and it now has a total of 49,018 acres. All of this wilderness is located in Nevada and is managed by the Forest Service. The Wovoka Wilderness was designated in December 2014. The wilderness is in the Great Basin, in western Nevada. The wilderness is named for Wovoka, a Northern Paiute, known for his visions and prophecies related to the Ghost Dance. The high point in the Wovoka Wilderness is 9,544' atop Bald Mountain. There are no system trails in the wilderness, and water is very scarce. 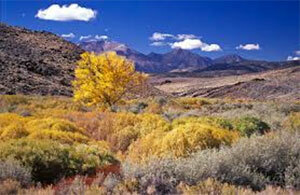 Vegetation and wildlife are classic Great Basin: pinyon, juniper, sagebrush, mule deer, sage grouse. The Wovoka Wilderness rewards exploration and wandering. You'll find expansive views on Bald Mountain, narrow canyons, dry lakebeds, and windswept silence. Planning to Visit the Wovoka Wilderness? How to follow the seven standard Leave No Trace principles differs in different parts of the country (desert vs. Rocky Mountains). Click on any of the principles listed below to learn more about how they apply in the Wovoka Wilderness.